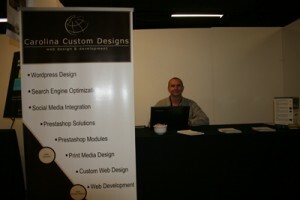 Carolina Custom Designs was privileged to take part in the first Prestashop Barcamp in the USA. The Barcamp was held in New York City on March 20th. We were excited to meet the Prestashop team, fellow vendors, and many from the Prestashop community. You can see a snapshot of our booth at the Barcamp to the right. If you are not familiar with Prestashop eCommerce solution send us an email and we would be happy to explain how Prestashop can help you with your online shopping cart. If you are interested in starting your own online business contact us today.